<< Click Page to Enlarge ..."Back" Button to Return to EN RADA. After all, haven't most of the Spanish colonial coins available for scholars and hobbyists today come from shipwrecks in the Americas...and other submerged locations around the world? Join with us in our study of this fascinating subject and its breaking news. PLEASE CONTACT ERNIE RICHARDS (PH: 561-965-2930; E-Mail: SeaScribe@att.net; or US MAIL: P.O. 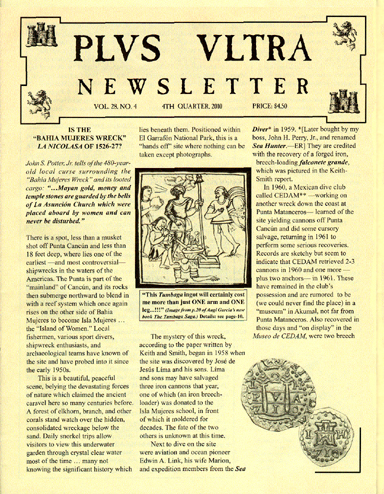 Box 1697, W. Palm Beach, FL 33402-1697 ... and start enjoying PLVS VLTRA Newsletter without delay. BACK ISSUES WILL BE AVAILABLE FOR ONE YEAR! "GREATEST ARTIFACT FROM THE 1733 TREASURE FLEET"
One of my favorite Florida Keys shipwrecks has to be the 1733 Spanish warship El Capitana Rubí. This wreck site lies in 19 to 21 feet of normally warm and clear water, and the bottom around it is pure white sand, interrupted by an occasional grass patch teeming with tropical fish. The main ballast pile disappeared from sight long ago, having been turned over by salvors so many times. I don’t know of a seasoned treasure hunter in the Florida Keys who hasn’t fallen in love with “Art McKee’s Galleon,” as we used to call the capitana. In the early 1950s a fisherman named Reggie Roberts told Art about the big cannon-covered pile of rocks out near the edge of the reef off Plantation Key. This intrigued Art, and he persuaded Reggie, accompanied by his two sons Earle and Jack, to take him out and show him the wreck. It was everything they claimed it to be, and more. What none of them knew then was that they had found Lieutenant General Don Rodrigo de Torres’ flagship of the ill-fated 1733 New Spain Fleet. From time to time, when both mood and weather prevailed, I would go out with my underwater metal detector and a couple of 100 cubic-foot dive tanks to play around the scatter pattern of the “Capitana.” The wreck lies about 4-1/2 miles off shore, just outside state waters. So, back in 1987, before passage of the Florida Keys National Marine Sanctuary Act, it was fair game for anyone who wanted to work it. I kept my 16-foot fiberglass skiff, with a 120-horsepower Johnson outboard motor, tied to the dock of my canal-front home off Snake Creek, and it would only take me twenty minutes to be over the capitana’s remains. I vividly remember that fateful day, 25 April 1987, when the ocean was flat calm, the wind light, and the sea beckoning. So I gathered up my dive gear and loaded the boat that morning. On my way out to the wreck the water raced beneath me like a transparent rug. It was one of those rare days in the Keys when the water was crystal clear. As the ocean floor streaked past I could see waving gorgonia fans, grass patches, and sponges, and needle-nosed balao tail-walked playfully in front of the boat. As I passed Hen and Chickens Light, about two miles from the “Capitana,” I spotted a flock of resident cormorants perched on the white dung-splattered iron framework, holding their wings spread wide to take advantage of the light breeze to dry their feathers. About a quarter-mile before reaching the “Capitana” the boat raced across a long black reef. I glanced over my shoulder and lined Hen & Chickens Light up with a group of trees on Windley Key. This was the range which I would follow out to the main site. Once there, I worked my way to the north past a few grass patches and dropped the anchor in a sand hole about 250 yards from the main pile. I switched off the motor and let the boat settle back gently on the anchor line. 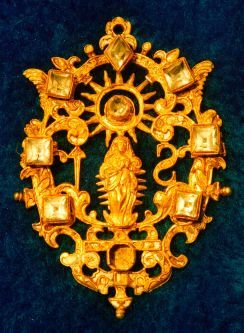 “GREATEST ARTIFACT RECOVERED From the 1733 Treasure Fleet” is what Mendel Peterson calls this unique gold-and-gemstone symbol of the Spaniards’ faith in the Holiness of Mary, Mother of Jesus. The water temperature in late April was edging toward 78 degrees, and a wetsuit jacket still felt comfortable, so I struggled into my well-worn and patched 3/16-inch neoprene top and proceeded to tank-up for the first dive. Finally, all suited up and with my underwater metal detector in hand, I stepped off into history. When the bubbles ceased I gave my mask a final clearing and headed for the bottom. It was a good day, and visibility was about eighty feet in all directions. A three-foot-long resident barracuda came gliding over to see what all the commotion was about. It hung there suspended about thirty feet away, almost transparent and watching me with a large baleful eye. I looked around to get my bearings, turned on my detector, and started methodically searching the sandy bottom next to a grass patch. On the morning of 13 July there was an air of great excitement throughout Havana; the Nueva España Flota was leaving for Spain! A rosy sunrise greeted the ships as they worked their way out of the harbor, past stark-white Morro Castle, and into the open sea, where a fair southeast wind met them. Don Rodrigo de Torres’ flagship El Rubí, newly painted bright red and with cross-emblazoned sails, led the flota up the Bahama Channel. This swift north-flowing waterway, known today as the Gulf Stream, would give the ships an extra three to 3-1/2 knots boost and drive them up to the 34th parallel, where the predominant westerly winds would carry them home to Spain. That was the plan. However, a fast building tropical cyclonic weather system 300 miles to the southeast had other plans for them. A brown stained, wrinkled and worm-eaten letter I found at the Archive of the Indies in Seville, Spain best describes what happened next. It was written by the Spanish Naval Commissioner, Don Alonso de Herrera, to the President of the Council of Trade in Cádiz, Spain. “On the 14th of July we discovered the islands of the Florida Keys. By 9:00 that night the wind began to rise out of the north. It continued to freshen to the point where we all knew a hurricane was imminent. We found ourselves close to the expressed keys, with the wind and sea so strong we were unable to properly govern ourselves, and each new gust came upon us with renewed major force. “On the 15th signs were made among the ships of the fleet to try and arrive back to La Havana. But we were unable to do so for the wind went around to the south without slacking in force or lessening the height of the seas. By 10:30 that night we had all grounded on the expressed keys at a distance of 28 leagues in length. THIS TWO-SIDED MEDALLION OF Our Lady of Guadalupe has been valued by four independent appraisers at $200,000 to $250,000 due to its rarity, importance, beauty, and excellent condition. PHOTO by Jack Haskins. The ships of the New Spain Fleet numbered 21, counting the two supply ships going along in convoy to Saint Augustine. One of the ships, El Africa of Captain Daniel Huboni, managed to save itself by deploying two huge storm anchors in 200 feet of water east of the north Key Largo reef line. The rest grounded on top of the reefs and shallows of the Florida Keys, from north Key Largo to Marathon. Several were refloated and taken back to Havana, but the remains of the bulk still lie here awaiting the persistent treasure diver. In 1974, I worked the “Capitana” under contract with the State of Florida (S-14-A), with a company called Peninsular Exploration & Salvage, Inc., which was operated by Richard MacAllaster and Rex DeRosay. We worked the wreck with an ancient 50-foot fishing boat, equipped with a mailbox-type dredging device that swung down over the ship’s lone propeller. When the ship was tied off with anchors and placed in gear in twenty feet of water, the propwash would create a hole 35 feet in diameter and eight feet deep. We found lots of artifacts with this old contraption. We were always accompanied by a State Agent who catalogued and tagged everything that was brought up. There was this one thing I found which will always stay burned indelibly in my memory. It was an ivory, hand-carved combination sundial and magnetic compass, about three inches tall by one inch in diameter. This piece, along with many other “Capitana” artifacts, can still be seen in the State of Florida’s shipwreck display in Tallahassee, Florida. So when I went out diving that day in April of 1987 I was visiting a wreck which was no stranger to me. I worked around the grass patch for about an hour, picking up several encrusted ship’s nails, which I placed in a pile at the base of the grass patch. My thoughts went back to one particular day on the capitana when I had spotted what looked like a flintlock pistol, about thirty feet away. It was lying on the surface, partially camouflaged by virtue of nature. I flippered over and placed my detector loop over it. The resulting loud squeal confirmed my suspicions; the object was a 1733 vintage flintlock pistol! It is amazing what you can find on the bottom if you know what you’re looking for. As I continued to methodically search the bottom, I was easing away from the grass patch and now was searching an area of open sand about fifty feet east of it. Suddenly my underwater detector let out a squeal. I laid the detector down and proceeded to hand-fan away the sand and coral debris. When I had a hole about six inches deep I placed the loop into the depression. “Squeeeeeal!” This time much louder. Knowing I had to be close to the buried object, I gave a couple of more fast sweeps with my hand, stirring up a big cloud of brown sand and rotted grass debris. When it cleared, a grayish object appeared in the center of the hole. I reached down and carefully felt the object. It was loose, so I brought it up out of the hole and examined it carefully. It appeared to be an iron lock hasp of sorts, the type which would have been used to secure someone’s personal baggage or trunk. I reached into my wetsuit and dragged out a net “goodie” bag, carefully placing the hasp inside. This was a “keeper,” and I intended to preserve it. When detecting, there is an unwritten law: Whenever you find something in a hole you always check again to see if anything else is in there. So I placed the loop down in the hole and it gave off another squeal. Carefully, and now with a hint of excitement since I knew the lock hasp was a sign of someone’s valuable baggage, I hand-fanned the hole deeper. After a couple of minutes I was down to about twelve inches, exposing large hunks of coral rubble. though it was heavily coated with dead coral, I could still make out the jewels around the central figure of Our Lady of Guadalupe. I turned it over and realized the other side was crafted as well. It was a two-sided medallion, which made it even more desirable. Instinctively, I swung the loop over the hole, hoping for the impossible. Nothing. The area was clean. I unbuckled my weight belt, which had a surface buoy tied to it, dropped it into the hole and swam my golden prize back to the boat. I reached over the boat’s gunwale and carefully placed the medallion on the seat before scrambling back aboard. I shucked off the air tank, kicked off my fins, and sat down on the seat. Carefully I peered at the golden Madonna, knowing I was the first person to do so in over 250 years. It was even more beautiful on the surface, and I knew I had found something of indeterminable worth. It was the day of all days for me, and the beginning of a lifelong struggle to try and top it. Life has a way of turning sweet or sour in a heartbeat, so to speak. On 25 April 1987 I found the greatest artifact of my shipwreck salvage diving career. On 27 April I had to commit my best friend to eternity. My buddy of ten years through thick and thin, Henry the Cat, had terminal cancer, and my last kindness to him was to have Dr. Foley put him to sleep. They say this is the ultimate act of love between an animal and its human companion. Maybe so, but it was the hardest damned decision I’ve ever had to make. "Cast and carved gold filigree medallion, 78 mm x 50 mm. For wear on a neck chain. Set with nine quartz crystal stones: 6 square, 1 diamond shape, 1 octagonal, and 1 round brilliant. Reverse shows a monstrance in Glory with “S” left and “I” right. Obverse shows the Virgin of Guadaloupe in Glory. Weight of the piece is 38.1 dwt. 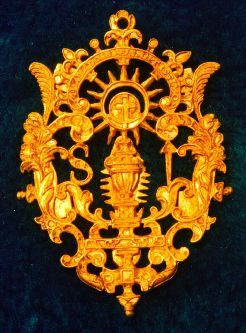 Over monstrance is a ribbon inscribed (in translation) “Salvation to the Holiest One.” Obverse has inscription partially covered by the jewels." This story, along with before-and-after color photos of the medallion, have been included in Bob “Frogfoot” Weller’s upcoming book about the 1733 Spanish Treasure Fleet, Galleon Alley, due out in mid-2001. —ed.